Kentucky Fried Chicken is the world’s most-popular chicken restaurant chain. But while Colonel Sanders’ secret recipe for fried chicken may be finger lickin’ good, the brand strategy has been finger pointingly bad. In the beginning, things were great. The Kentucky Fried Chicken brand was born in the 1950’s. Colonel Sanders himself created his secret “original recipe” for chicken which he cooked in a pressure fryer to deliver his chicken faster and fresher than the competition. And the Colonel himself travelled from town to town cooking chicken for restaurant owners and signing up franchisees. By 1960, Kentucky Fried Chicken had more than 600 franchised outlets in the United States, Canada and England. 1. Be first in a new category. Pressure-cooked fried chicken with secret spices. Kentucky Fried Chicken quickly expanded the business becoming a national then an international chain. The rapid expansion blocked the competition and allowed them to own “fried chicken” in the mind globally. 3. 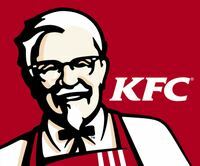 Create a brand personality: Colonel Sanders. Sure you can succeed by just being first (like Pizza Hunt in pizza.) But you can become so much more powerful if you use a strong spokesperson to lock your brand into the mind. Dave Thomas and Wendy’s. Papa John and Papa John’s Pizza. Michael Dell and Dell Computer. Howard Schultz and Starbucks. How well known is Colonel Sanders? Well in 1976, an independent survey ranked the Colonel as the second most-recognizable celebrity in the world. Not bad for an old guy from Kentucky selling pressure-fried chicken in a funny suit. Every brand needs a story. Every brand needs a spokesperson. And Kentucky Fried Chicken has both a wonderful story and a spokesperson. And even though the Colonel had sadly passed on, it doesn’t matter. His image and legend lives on today. It’s just as relevant and integral in selling his namesake chicken as it ever was. The wave starts to crest. The mistake most managers make is thinking the good times will last forever. They don’t. You ride a wonderful wave of brand success which eventually either crashes you into the rocks or slowly rolls you into the shore. Kentucky Fried Chicken is still the biggest and most well-known chicken brand in the world. But it faces a serious problem. A problem management has incorrectly dealt with time and time again over the last 20 years. The problem: fried food is unhealthy. And people are looking to eat healthier. So what has Kentucky Fried Chicken been doing? You know what they have been doing, they have been trying to run away from “fried” the only idea they own in the mind, as well as copy every hot new chicken trend. In 1991, Kentucky Fried Chicken changed its name and signage to KFC. As if using only initials removes fried from the name. It doesn’t. People may use the abbreviation to refer to the restaurant, but the abbreviation is just short hand for Kentucky Fried Chicken. The focus is still on fried albeit it with a weaker name. Initials are never more powerful than a strong brand name. Changing from a strong brand name to initials doesn’t make sense. Boston Chicken was a big success, so KFC launched Colonel’s Rotisserie Gold and Tender Roast chicken. White Castle was a big success, so KFC launched the Chicken Little sandwich. McDonald’s was a big success with McNuggets, so KFC launched Kentucky Nuggets. Were any of these successful line extensions for KFC? No. All have since been discontinued. Today, KFC is going back to basics and expanding all at the same time. And all slapped together in a new name. Now the bad news. With “fried” still a worry, company leaders are adding “grilled” to the name. As if Kentucky Fried Chicken could become healthy like in some bad reality makeover show. 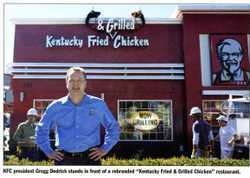 The new name expected to roll out nationally in 2009 is: Kentucky Fried & Grilled Chicken. They will have the good, the bad and the ugly all together in one name and one giant mess. The reality is that people are still eating fried foods and fried chicken. Not too many people are going for the carrot sticks over the fries. The future may belong to healthier alternatives. But the now belongs mostly to tasty higher fat and calorie eats. I think there is a compromise right in front of Kentucky Fried & Grilled Chicken’s eyes. A way to keep the bad and include the good without resorting to a long and difficult name. Why not just call it Kentucky Chicken? That name would work globally and solidify Kentucky Chicken as the dominate chicken brand for today and allow them to transition to healthier fare for the future. Hand me a napkin, this is one mess that can easily be cleaned up.